Air conditioning Kit Solar optimized for solar panels 720Wp solar panels. The adjustable air conditioning which makes saving. The 3D solar air conditioning is specially designed to increase efficiency through the use of photovoltaic solar energy as support apparatus generated by solar panels. The combination of this system with photovoltaic solar panels rises saving the most, being a great example of using residential solar power. Actuation of air conditioning systems directly photovoltaic has the advantage of being high efficiency and easy assembly having a robust reliability. The photovoltaic panels and equipment to connect the network simultaneously without couplers or other extra items. The photovoltaic panels are connected directly to the input of the solar charge controller included in the outdoor unit. Studies show that these solutions are very interesting economically, given the increase in electricity prices and falling price of photovoltaic modules. Its simplicity is that it needs no external solar charger and solar inverters to convert DC power from photovoltaic solar panels (generated by photovoltaic cells) AC corrriente, if not directly using direct current. The absence of this transformation, which will be achieved through solar inverters means lower costs and higher yields, fueling the air conditioner cheaper than the grid alternative energy. Valid for conventional homes connected to the electricity grid or off-grid homes. In the first case allows significant savings in consumption, even decreasing in the contracted power if the summer determines told us most. And in the case of isolated houses, which have an AC network created by an investor, it is especially interesting because it has an option to only consume photovoltaic panels, allowing us to avoid overloading the plant and to have air conditioning. This option also allows us to heat the house even when we are not in it for you to get is already at the desired temperature, knowing that we autoconsumiendo energy that we generate. 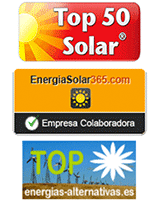 - 3 photovoltaic panels 240-250 Wp. In addition, and as an option can also be added to save battery possible excess energy collected by the solar panels. Energy savings are greater because the energy collected by the panel stored and the device needs less and less use the network to function. This option is not included in the kit. Split is going on inside the house stands out for its aesthetics and design. Furthermore, energy efficiency is one of the highest market values, being of "A ++" for the cooling mode and "A +" for the heating mode, thanks to its inverter technology, used both his fans and the compressor.